Hello everyone! I'm a day late sharing today because my week has been so incredibly crazy, but I'm so delighted to bring you this week's tour!! I have just made a new friend and I want you to meet her. She is so delightful and her blog is full of fun and beauty that is sure to inspire you!! Meet Katie and join me as we tour her beautiful home. 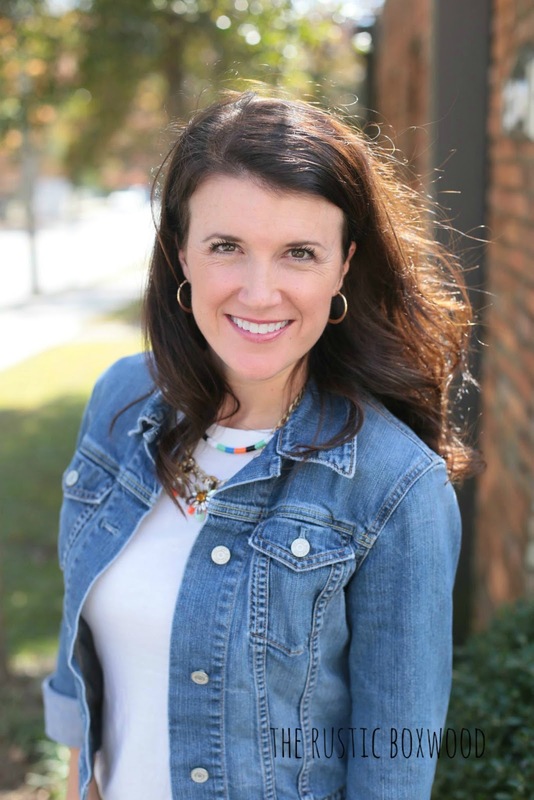 Katie is the author of The Rustic Boxwood. (Doesn't just the name of her blog make you want to see everything she has going on?) So enough from me, let's get started! 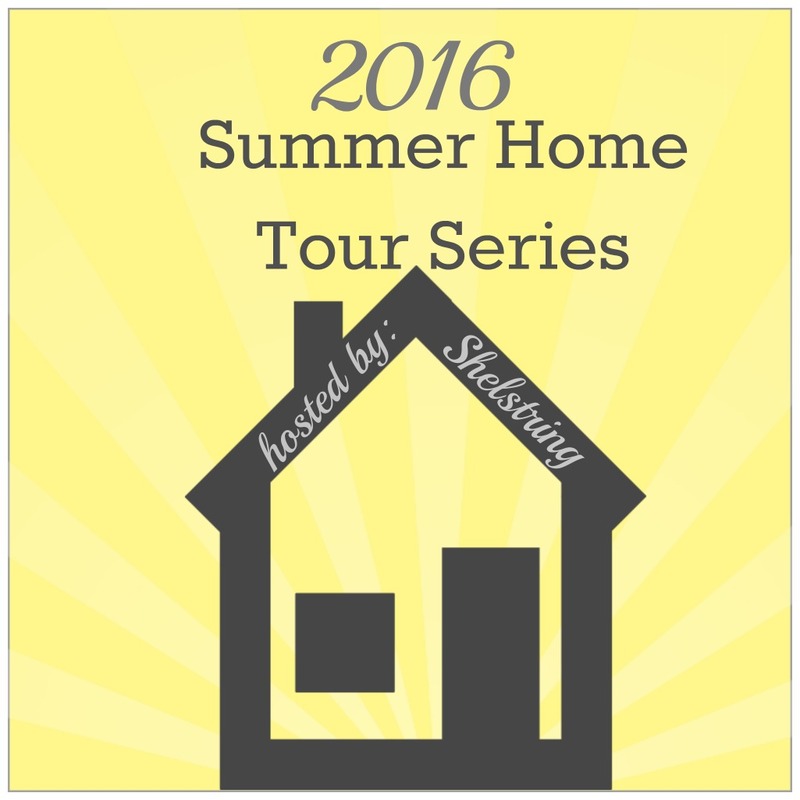 What an honor it is to be able to join Michele and her beautiful blog, Shelstring, in her series, "Summer Home Tour." 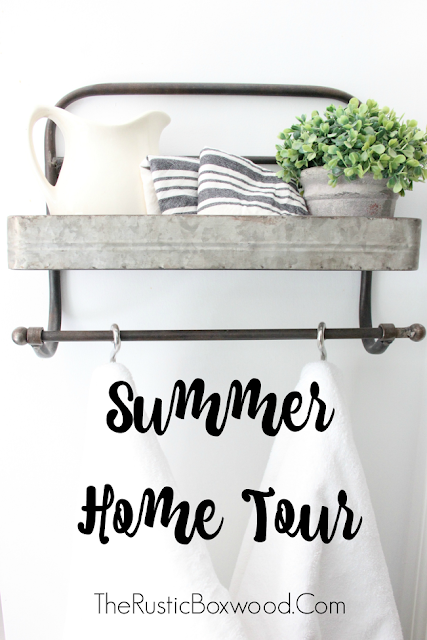 There are some gorgeous homes in this series, so when you finish reading this post, you seriously ought to check out all the other bloggers' inspiring homes! ;) Thank you, Michele, for this exciting opportunity! Hugs to you, sweet friend! Welcome to our little home in the gorgeous (and hot!) state of Georgia! We live just outside of Atlanta, and I'm so excited to share with you a little piece of Georgia livin'! We live in a cookie-cutter house on the exterior, but on the interior, we've made it our own. Pretty much everything that you'll see in the pics below are diy projects and thrifted decor....That's how we save our hard-earned cash, and it's what gives me the freedom to change out the decor quite often! So come on in! It's great to have you! When my husband and I first bought this home a long time ago (almost 13 years ago), everything was builder grade...from the carpeted floors to the basic cabinets. But slowly, one project or room makeover at a time, we've made it our own. We've torn down some walls, replaced the carpet with new flooring, painted the front door white, and added a covered back porch, to name a few. You see that beautiful, stately buck mounted to the wall? My talented hubby skillfully got it while on our annual hunting trip to Kansas this past fall. Every year, we pile the kids in the SUV and take a road trip out west to visit the Mr.'s precious grandparents and extended family. It's a special time, and we always looks forward to seeing everyone! This old, baby grand piano is the piano I grew up practicing on -- day in and day out -- during my middle and high school years. It needs some serious tuning, but I still love it! My wonderful hubs built all the cabinet boxes for our kitchen, and then we ordered the bead-board doors from a local cabinet shop! We also recently remodeled both the guest bathroom and the master bathroom. We love how they both turned out! It's amazing what a fresh coat of white paint can do to a room! If you'd like to see more pics of our guest bathroom, plus before and after photos, click on this link, and it'll take you straight to that post! This bathroom is my favorite room in the house! It's our "DIY, Farmhouse-Styled" bathroom! You can click here to read all about it and how we transformed this space under $6,000! And the last interior room I'd like to show you is a little sneak into our master bedroom. :) You see that headboard? You know what I'm about to tell you, right? Haha. Yep, it's a thrifted headboard, and it's been given a total makeover. Click here to find out how I used chalk paint to give it a fresh, new look! Connected to the dining room is our back porch that we practically live on every night! After we added the concrete porch to the back of our home, my sweet hubby (and his daddy) installed the ceiling and some fans to this space, which has become a haven for our family and friends! These rockers are so comfy! And that bar cart is an estate-sale find. It's slowly gotten more chippy and rusty, which fits in perfectly with all our other rustic decor! Thanks again so much for stopping by! I hope you enjoyed your "online" visit! 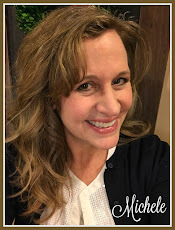 Stop by and say hello on Instagram, Twitter, Facebook and Pinterest! I'd love to hear from you! And Michele, thanks so much for having me. You are a sweetheart! Thank you Katie, it has been such a wonderful pleasure!! And thank you all for joining us today, I cannot pick a favorite no matter how hard I try!! Can any of you? It wouldn't be any wonder if the rest of her home makes it into one of Country Living's magazine pages. I love so many touches that make her home so unique and am in awe of the view of the surroundings of her beautiful home! The one who is truly sweet is Katie. You will have to hop on over and enjoy her blog. There are so many inspiring projects and posts you won't want to quit discovering. Have a wonderful weekend making your home your own, just like Katie's! See you next week when you join me for Emily's tour from The Small Stuff Counts. See you then! Thanks so much, Michelle, for having me this week. I've really enjoyed getting to know you, and I'd love to work with you again soon! Hugs!